Several coastal areas show evidence of isostatic uplift, which has produced raised beaches and inland cliffs and, sometimes, freshwater or brackish small lakes. The surface of these periglacial environments is characterised by scattered erratic boulders and suites of glacial till and unsorted rock rubble. In general, moraines are rare and limited in size compared to those in the Alps or other mid-latitude regions. On the contrary, sediment cores from continental shelves around Antarctica show a widespread occurrence of glacio-marine deposits (Anderson JB 1991 Barrett et al. 1991). Acoustic basement rocks have been sampled at two sites, and are Palaeozoic Beacon Formation rocks at the CRP-3 site adjacent to the coast (Cape Roberts Science Team, 2000) and are inferred palaeozoic and Cretaceous igneous and metamorphic rocks at DSDP Site 270 in the centre of the Ross Sea (Hayes and Frakes, 1975). The basins are believed to hold sedimentary rocks of Cretaceous and younger age (Hinz and Block, 1984 Cooper et al., 1991c), but Sedimentary rocks older than late Eocene have not been cored by drilling. 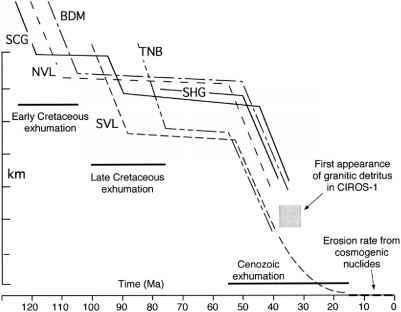 Upper Eocene sediments have been cored in the CIROS-1 drillhole in McMurdo Sound (Coccioni and Galeotti, 1997 Fielding et al., 1997 Hannah et al., 1997 Monechi and Reale, 1997). The presence of ubiquitous lonestones (Barrett, 1989) testifies that glaciers (but not necessarily continent-size ice sheets) were calving at sea-level then. Drill cores from the middle Miocene have been recovered at DSDP Sites 272 and 273 (Hayes and Frakes, 1975 Savage and Ciesielsky, 1983 Leckie and Webb, 1986), and consist of diatom-bearing sediments interpreted as waterlain tills and proximal- to distal-glacimarine deposits (Hambrey and Barrett, 1993). Upper Miocene rocks are missing from all continental shelf drill cores, except in the McMurdo Sound region (MSSTS-1, DVDP-10 and -11 drill sites), where glaciomarine diamictites (tillites) and terrestrial strata are found. These deposits are interpreted as having originated from glaciers flowing out of the Transantarctic Mountains (Powell, 1981 Barrett, 1986 Ishman and Webb, 1988 McKelvey, 1991). The long-term record of environmental change at high latitudes is held mainly in deep-sea sediments and large submarine fans. For example, an important indicator of the initiation of continental-scale glaciation to sea level at the beginning of the Cenozoic Ice Age is the first occurrence of coarse-grained iceberg-rafted debris within fine-grained abyssal muds thus, major ice-sheet growth began about 35-40 Ma in Antarctica, 7 Ma in Greenland and about 2Ma in Fennoscandinavia (e.g. Jansen & Sj0holm, 1991 Larsen et al., 1994 Barrett, 1996). Similarly, the variability in grain size of debris in finely laminated drift sheets on high-latitude margins demonstrates the changing velocity and direction of major ocean-current systems over glacial-interglacial intervals (e.g. Pudsey, 1992). Such changes are important to global-scale transfers of mass and energy in the Earth system. Lithostratigraphic data from Antarctic margin drill cores show clear evidence on the shelf (PB, RS) for linked sea-level and ice-volume changes. 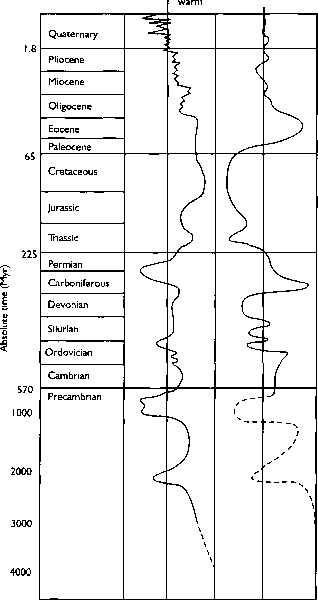 This is best shown in the Oligocene through early Miocene record of cyclic glacial and interglacial lithologies near the coast in Cape Roberts cores (WRS) (Barrett, 2007). Lithostratigraphic data from the slope (PB) and rise (PB, AP) show additional direct evidence for cyclic ice-volume changes. Seismic-reflection data provide indirect evidence across the entire margin for the linked sea-level and ice-volume fluctuations that have been noted by many investigators and have been modelled in the RS (Bartek et al., 1991) and presented conceptually for all margins (ten Brink et al., 1995). The Antarctic drill cores are too limited, however, to establish the timing, magnitude and extent of individual ice sheet advances onto the continental shelf, other than for the LGM. Directly linked and causally related to the development of the WARS (e.g. ten Brink et al., 1997 Studinger et al., 2004, and references therein). The Transantarctic Mountains uplifted 6-10 km in an asymmetric tilt block formation and underwent denudation from the Cenozoic to the Cretaceous (Fitzgerald, 1992, 1995 Studinger et al., 2004). The later part of the uplift and denudation phases occurred under persisting spreading extension within the western Ross Sea (Cande et al., 2000) and has been concomitant with voluminous sediment infilling from the Late Eocene Oligocene to present (Barrett et al., 2000, 2001 Hamilton et al., 2001). Extensive scientific seismic exploration surveys have accumulated considerable information to define the geological setting of most of the circum-Antarctic basins (Mclver, 1975 Ivanhoe, 1980 Mitchell & Tinker, 1980 Cameron, 1981 Behrendt, 1983b Aleyeva & Kucheruk, 1985 Davey, 1985 Ivanov, 1985 St. John, 1984 Elliot, 1988 Cook & Davey, 1990 Collen & Barrett, 1990 Anderson et al., 1990, among others). This is not to imply that the use of a single form of health care or a single method for the development of new drugs is either inevitable, or even desirable. In the quest for health it is fair to say that all 'guns' should be brought to bear. An economic approach to health care implies that there are inevitable trade-offs to be made between the cost-effectiveness of different health care portfolios, even that of pharmaceuticals based on plants. Having raised these larger issues, this chapter now focuses on only a narrow area of this portfolio the development of pharmaceutical products. Myriad approaches have been proposed officially by nations, such as Brazil (Brazilian Ministry of Science and Technology, 2000), or by various researchers (Barrett, 2003 Cooper, 1998 Edmonds & Wise, 1997 Global Commons Institute, 1996 Heller & Shukla, 2003 McKibbin & Wilcoxen, 2002 Muller, 1999 Nordhaus, 2001 Schelling, 2002 Victor, 2001). These proposals are diverse in terms of approach, measures, and mechanisms. Two broad trends emerge among the proposals one is results oriented and the other is process- or conduct-oriented. A brief discussion of these two types of proposals for engaging developing countries in mitigation actions follows. Cloud-resolving models (CRMs) have evolved as one of the main tools for studying the links between key processes pertinent to studying cloud-related feedbacks (e.g., Browning, 1993 Grabowski, 2000). As such, these models may be viewed as an essential tool for articulating the underlying theories of cloud feedbacks. These models continue to improve and are now being adopted more widely in a variety of cloud and precipitation research activities. CRMs are also being coupled experimentally ways into global models to serve as an explicit form of cloud parameterization, thereby overcoming the problematic separation between resolved cloudiness and unresolved convection (Randall et al., in press). This fruit can be processed to obtain juice. The peels are around 30 of the fruit and constitute an interesting source of procyanidins (mainly polymeric). The polyphenol oxidase activity has to be inactivated before or during extraction to avoid browning and polyphenols degradation. Other agricultural wastes are the bracts which are especially rich in anthocyanins (delphinidin, cyanidin, pelargonidin, peonidin, petunidin and malvidin) (Pazmino-Duran et al., 2001). In addition, carotenoids (xanthophylls) ester-ified with myristate, laurate, palmitate and caprate have also been reported (Subagio et al., 1996). James Hansen considers sea level rise as the big global issue that will transcend all others in the coming century.19 Even if the East Antarctic Ice Sheet is not destabilized, the steady melting of the Greenland Ice Sheet together with the perhaps sudden melting of the West Antarctic Ice Sheet holds the potential for some 12 meters (40 feet) of sea level rise.20 The melting of the East Antarctic shelf would add approximately 25 meters (80 feet) this would mark, in the Antarctic research scholar Peter Barrett's words, the end of civilization as we know it.21 Even without a melting of the East Antarctic shelf, civilization would be experiencing an inexorable encroachment of seawater over decades and centuries. Operation of these safety nets is typically improved when programs are in place before a shock arrives, and when governments hold reserve funds for their operation (given that government revenues, and thus funding, can also decline in a bad year) (World Bank 2008). In the specific case of food aid, most research suggests cash-based food aid is a more efficient means of aid delivery in the face of shortfalls, although there are caveats (Barrett and Maxwell 2005). Barrett, P.J. and Hambrey, M.J. (1992) Plio-Pleistocene sedimentation in Ferrar fjord, Antarctica. 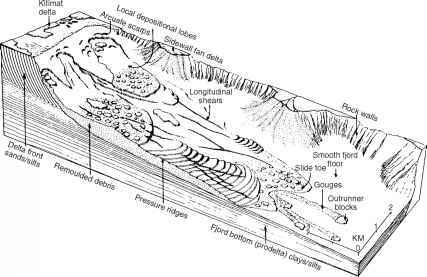 Sedimentology, 39,109-23. Hambrey, M.J., Barrett, P.J., Ehrmann, W.U. and Larsen, B. 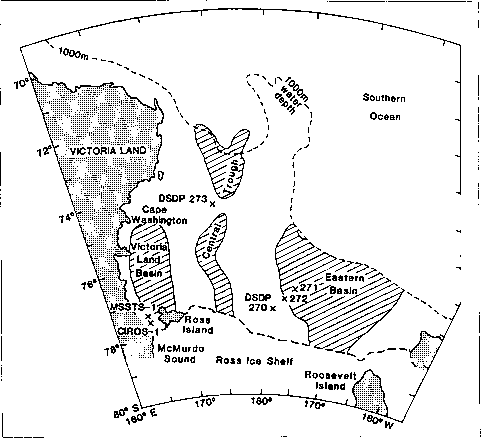 (1992) Cenozoic sedimentary processes on the Antarctic continental shelf the record from deep drilling. Zeitschrift Fiir Geomorphologie, 86, 77-103. Cloud-climate feedbacks can be simulated with general circulation models (GCMs). To gain confidence in the results from these simulations, the reliability of the physics of climate models (e.g., the representation of turbulence, convection, aerosols, and clouds) must be improved (Illingworth and Bony, this volume). For this purpose, a well-recognized methodology, which forms the basis of the GEWEX cloud system studies, can be employed the physics of climate models within a single-column framework are compared with observations from field experiments and or LES or CRM simulations driven by observed forcings (Browning et al. 1993 Randall et al. 2003). The resulting parameterizations are then evaluated in a full 3-D GCM with global datasets to assess whether an improvement of cloud representation has been achieved. Such an approach can be very powerful in pointing out deficiencies in model parameterizations and in improving model parameterizations. John (1986) considered to be viable hydrocarbon targets, those of the Ross Sea region rank highly (e.g., Holdgate and Tinker, 1979 Lock, 1983). Modelling studies suggest that, of the three Ross Sea basins (Fig. 11.11), the Eastern and Victoria Land basins have good exploration potential, while the Central Trough is barely marginal (Cook and Davey, 1984). Discovery of ashphal-tic residues at a depth of c. 633 m near the base of CIROS-1 (Barrett, 1987) will further tantalize hydrocarbon prospectors. There are several major challenges in obtaining deep reductions in CO2 emissions. For the world to cut CO2 emissions deeply, nearly all actors would need to nearly totally eliminate their CO2 emissions. However, the burning of fossil fuel produces immediate benefits to the user of the energy thereby attained. By contrast, the climate costs of that fossil fuel burning will be borne broadly throughout the world and primarily by future generations. The fundamental political challenge of CO2 emissions reduction is to create institutions that would make it in the self-interest of the vast majority of actors to sharply curtail their CO2 emissions (Barrett 2003), starting from the condition wherein benefit accrues rapidly to the emitter and the climate costs are borne primarily by others distant in space and time. Launched in 1999, the Dow Jones Sustainability Indices (DJSIs) are the first global indices tracking the financial performance of the leading sustainability-driven companies worldwide. The Dow Jones STOXX sustainability indices consist of a pan-European and a Eurozone index the Dow Jones STOXX sustainability index (DJSI STOXX) and the Dow Jones EURO STOXX sustainability index (DJSI EURO STOXX). For both of these indices a composite and a specialized index are available, with the latter excluding companies that generate revenue from alcohol, tobacco, gambling, armaments, or firearms. See www.sustainability-indexes.com . This variation, also known as neolithic time lags is explored by Jared Diamond, The Third Chimpanzee The Evolution and Future of the Human Animal, and in Diamond, Guns, Germs, and Steel The Fates of Human Societies. 27. 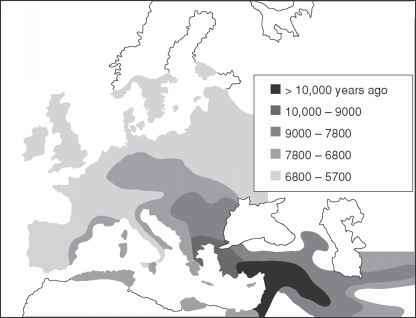 Alfred Crosby, Ecological Imperialism The Biological Expansion of Europe, 900-1900 (Melbourne and Cambridge Cambridge University Press, 1986), Diamond, Guns, Germs, and Steel The Fates of Human Societies. Paint application generates wastes as well as paint manufacturing. Paint application wastes include empty paint containers, spent cleaning and stripping solutions, and paint overspray. Buying paint in containers of a size suitable for the application can reduce unused paint wastes. Segregating non-hazardous from hazardous waste streams is also important. Paint overspray can be reduced through operator training and proper handling of spray guns. Preventive maintenance of equipment and avoidance of reject paint applications can significantly reduce the wastes generated from stripping and reworking a job. Use of dry painting techniques such as powder coating is also a promising way of reducing wastes. The onset of subsidence at the westernmost margin of the VLB. The first direct geological evidence of a major pre-Oligocene uplift phase of the Transantarctic Mountains comes from the oldest strata cored in the CIROS-1 and CRP-3 drill-holes (Barrett et al., 1989, 2001). These include granitic clasts eroded from exposed basement to the west, implying that the Transantarctic Mountains were at least half of their present height by then, for erosion had cut through the more than 2,000 m of Devonian-Jurassic Gondwana cover beds to basement (Barrett et al., 1989, 2001). In the Cape Roberts drill core, the presence of the Devonian Arena Formation (Beacon Supergroup) as bedrock beneath the Cenozoic sediments indicates that significant uplift and unroofing of the Transantarctic Mountains must have occurred prior to the Oligocene (Barrett et al., 2001). I was thrown to the ground about three sajenes about 23 feet, or 7 m away from the porch and for a moment I lost consciousness. . . . The crash was followed by noise like stones falling from the sky, or guns firing. The earth trembled, and when I lay on the ground I covered my head because I was afraid that stones might hit it. Some scientists believe that ice ages may be caused by the variations in sunlight hitting the Earth during its solar journeys. 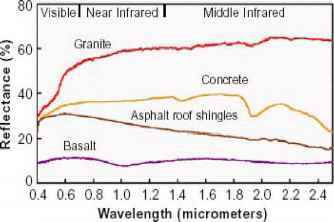 However, the amount of sunlight during the solar journey has to be combined with solar variations. The sun goes through cycles of activity in which varying levels of energy are emitted. The solar energy variations are related to the presence and absence of sunspots. Increases in these are likely to also bring about an increase in aurora lights, in both the Northern and Southern Hemispheres. The aurora lights are connected to the magnetic field of the Earth. Researchers studying the sun's magnetic activity over 100,000-year cycles have proposed the theory that the climate of the Earth is affected by this solar activity cycle. Waldo S. Glock attempted to show a relationship between the weather as a part of a climate pattern and variations in periodic solar activity. In addition to these effects, in waterlogged saline land, root-zone hypoxia can lead to increased Na+ and or Cl- uptake to the shoots, which decreases plant growth and survival (reviewed by Barrett-Lennard, 1986, 2003). In a wide-ranging review of the literature, hypoxia under saline conditions caused at least 30 increases in either Na+ or Cl- concentrations in the leaves or shoots of 23 of 24 species surveyed (Barrett-Lennard, 2003). Born in Seattle, Washington, on March 7, 1909, Revelle was raised in Pasadena, California, and soon stood out as a gifted student during his academic career. In 1925, Revelle enrolled at Pomona College with an interest in journalism, but later switched to geology as his major field of study. In 1928, Revelle met Ellen Virginia Clark, a student at the neighboring Scripps College and a grandniece of Scripps College founder Ellen Browning Scripps. The couple married in 1931. Liquid biosolids can be injected below the soil surface by using tank trucks equipped with injection shanks or incorporated immediately after surface application by using plows. A tractor equipped with liquid biosolids injection lines can also accomplish subsurface application. The liquid to be injected is supplied by a hose connected to the injection device. The tethered hose is dragged along by the tractor. Advantages of subsurface application include minimization of potential odor and vector attraction, reducing ammonia loss due to volatilization, and elimination of surface runoff. Irrigation methods include sprinkling with large-diameter high-capacity sprinkler guns, and furrow irrigation. Sprinkling is used primarily for application to forested lands. The principal advantage of furrow irrigation is that liquid biosolids can be applied to row crops during the growing season without having the biosolids contact the crops themselves. Root rot and vascular browning caused by Acremonium spp., Chase et al. (1999a) found a clear thermal-infrared absorbing film as consistently more effective in increasing soil temperature than low-density polyethylene. 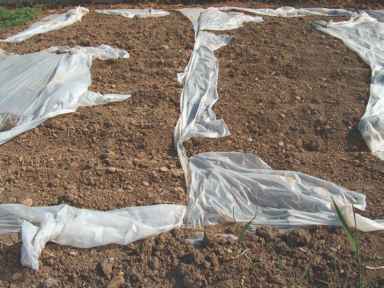 Numerical and field studies of Al-Kaysi and Al-Karaghouli (2002) showed that mulching soil with a paraffin-wax emulsion film, rather than transparent polyethylene, resulted in more effective soil heating and a faster killing of pathogenic soil fungi. 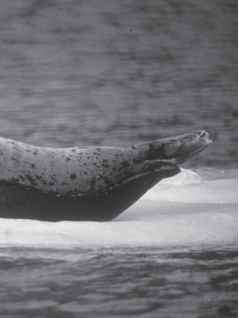 The travelers failed to kill any seals but did acquire specimens of loon, fulmar, kittiwake, and Greenland swallow. Dissections showed that the birds had a fat layer to protect against the climate, much to the surprise of the team. They shot and ate other birds such as rotges. By mid-June, the expedition crossed the Atlantic and entered Davis Strait to Baffin Bay. They encountered Inuit who taught the British how to catch seals by mimicking the animals through lying on the ice, grunting, and hopping along on elbows. On Hare Island, the British examined the ruins of Inuit huts and exhumed a grave before trading guns for Inuit dogs. When Ross saw a mirage that he mistakenly believed to be a mountain range, he believed that the ships could not move forward. The expedition returned to Britain and Parry immediately began to plan a return voyage. The integration of Arctic peoples into the global economy played out differently in various parts of the North. In Fennoscandia and parts of the Russian North, traders were eventually followed by settlers, who often displaced indigenous peoples from the best land and competed with them for resources, including furs. Always adapting to superior technology, indigenous peoples readily welcomed trade items such as metal cooking pots and firearms, glass beads, and wool blankets, for their labor-saving qualities. Commodities such as flour and tea provided a welcome variety to northern diets. These goods could be purchased with skins that were not generally targeted or could be harvested in the course of normal hunting activities. You can safely download your risk free copy of NGOA Buyers Club from the special discount link below.